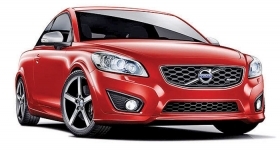 The 2011 Volvo C30 is one of three European small luxury cars on the market. As head of Mercedes-Benz USA in the late 1990s, Mike Jackson was determined to keep the ungainly, expensive A-class small car out of the United States. "The original A class, you would say, 'Oh, my God. I will never be able to sell that to anybody. What can I do to keep it out of the U.S. so I don't have to deal with it?'" Jackson recalls. Americans were unwilling to pay premium prices for small cars then, even if the cars wore luxury nameplates. And sales of such cars remain low. But European luxury brands aim to change that dramatically in the next few years. Eager to increase sales and meet strict government fuel economy standards, they plan to roll out new small cars with premium prices and luxury content. Now Jackson's on board. Mercedes-Benz unveiled a concept version of the redesigned A-class coupe in April at the New York auto show. Jackson, on the other side of the fence as CEO of AutoNation Inc., the country's biggest automotive retailer, calls it "absolutely beautiful." "That's the car I want tomorrow," Jackson says. Although other luxury brands, such as Lexus and Cadillac, are making similar moves, Europeans are leading the charge. The A class, expected in 2013 in the United States, is the first of a new generation of sub-$30,000 small cars that European automakers are convinced will sell in the United States. Today, three European small luxury cars are on the market: the Audi A3 hatchback, the BMW 1-series coupe/ convertible and the Volvo C30 three-door hatchback. They're low-volume vehicles, with combined U.S. sales of 23,596 units last year. A conservative tally of carmaker estimates shows U.S. sales of small European luxury cars at least doubling in the next few years. But some observers question whether the segment will ever be strong here. "Even at 50,000 units, it is an insignificant number," says Jesse Toprak, vice president of industry trends at TrueCar.com. "The potential growth for compact crossovers is much greater because of their utility." Mercedes-Benz and BMW will lead the effort to expand the segment. The route to success will be keeping the vehicles premium in content and performance, brand executives say. The new cars are different from the halfhearted attempts in the late 1990s and early 2000s. At that time, BMW offered the 318ti -- a 3 series with a lopped-off rear end -- and Mercedes-Benz in 2002-05 sold its odd-looking C230 and C320 hatchbacks. Those cars failed after a short run. Jeff Schuster, executive director of global forecasting at J.D. Power and Associates, says the recession and fuel prices have changed what buyers consider important. "They tend to look at it as 'What do I need versus what am I trying to show here?'" Schuster says. "Do I need a larger vehicle, or can I get away with a smaller vehicle and still have that content and desire?" Michael Cantanucci, whose New Country Motor Car Group owns three Mercedes-Benz, two BMW, and Audi and Mini stores in New York, Connecticut and Florida, has seen prototypes of many of the new smaller vehicles. Cantanucci says he doesn't believe they will dilute luxury brands' images: "They have the DNA in terms of product quality, styling, features and technology." That won't be a problem with the four new small luxury vehicles coming to Mercedes-Benz in the next three to four years, says Ernst Lieb, CEO of Mercedes-Benz USA. Safety features such as adaptive cruise control and traction control will come standard. In addition to the A-class coupe, Mercedes-Benz plans to import the B-class small van, probably with an electric powertrain, a small sedan it will call the CLC and a small crossover that will be called the GLC. Mercedes-Benz decided only recently to bring the smaller A class to the United States. Initially, executives wanted only the larger B class. But that decision was reversed several months ago after Steve Cannon, vice president of marketing, and a product committee including dealers saw early versions of the new small vehicles, Lieb says. The car wowed them, as it has other dealers who saw the range last month during a trip to Mercedes-Benz headquarters in Stuttgart. Lieb says Mercedes needs to use these cars in part to protect its E class and S class: "From a strategic point, if we leave that segment for our competitors, they become stronger and branch out and give us resistance in those segments. The time is overdue." Insiders say BMW's development of smaller front-wheel-drive cars isn't as far along as Mercedes'. Jim O'Donnell, CEO of BMW of North America, says a family of new small cars will go on sale in 2014, but the company hasn't decided which body styles to sell in the United States. Last month, Ian Robertson, BMW AG board member for sales and marketing, said BMW and Mini will expand their lineups and the two brands combined will have six to nine new small cars. He did not give details on body styles. The new BMW cars will be similar in size to Mini vehicles, O'Donnell says. Mini will be the first to use the new small platform known as UKL -- an abbreviation for the German for compact class cars -- with its new generation Cooper hardtop due in late 2013 or early 2014. O'Donnell says BMW is confident about small cars because of the success of Mini. BMW expected Mini sales to peak at 20,000 cars in the United States, he says. "We will do nearly 60,000 this year -- Americans are ready for small cars," O'Donnell says. The United States could take a small sedan from Germany but probably not a hatchback because there's still doubt that the body style will sell in this market, O'Donnell says. He doesn't expect big sales from these small cars. "They will be nichey, under 10,000 units," he says. BMW is attacking the small car market on another front with its i subbrand electric vehicles. First out will be the i3 electric in 2013, designed for urban drivers. Audi's A3 is as small as the brand will go in the United States for the next several years. Audi of America President Johan de Nysschen says Audi first needs to increase volume in the luxury high-end segments. Once Audi has achieved that goal, it can turn its attention to the less-profitable smaller cars, de Nysschen says. For now, Audi's only offering is the A3 hatchback. Audi showed a concept A3 sedan in March at the Geneva auto show. The sedan was designed with an eye to the United States and likely will be sold here in 2013. Audi USA may import the A2, a car smaller than the A3, if the brand decides to bring back that model. The A2 was discontinued in 2005. Audi won't bring the current generation of the A1 small car to the United States, de Nysschen says, and "that is the final decision." With annual U.S. sales teetering at just more than 50,000 vehicles, Volvo Cars of North America is focusing on its larger, more profitable vehicles, CEO Doug Speck says. Volvo sells the C30 in the United States, but the C30 was always meant to be a niche car, Speck says. Volvo expects to sell only 4,000 to 5,000 C30s this year because the three-door hatchback has "limited appeal" in the United States and the car is pricey, Speck says. The C30 has a base price of $25,575, including destination. Speck acknowledges that Mercedes-Benz and BMW will heat up interest in small luxury cars and says, "We need to have a plan to compete in that segment." He says he can't talk more about Volvo's product strategy, which has been fine-tuned since the brand's acquisition last August by China's Zhejiang Geely Holding Group. Speck believes growth in small car sales and transaction prices for U.S. volume brands will drive more luxury brands into the segment. "People are out there spending $23,000 and $24,000 for a Focus because they want all the bells and whistles," Speck says. "People do not want to sacrifice. They may say 'I can deal with a smaller space but I still want navigation, Sirius satellite radio and leather." Jackson agrees, saying there is a "risk for the luxury manufacturers if they simply benchmark against themselves." "The content certainly needs to match what you can get in a Ford or a Chevy with reasonable up-charges," Jackson says. "There is a revolution going on in the volume segment as far as content and innovation and the consumer's willingness to pay for that content and innovation." Tom Libby, an automotive analyst with R.L. Polk & Co., says pricing small luxury cars is tricky -- if the cars are priced too close to their larger siblings, luxury buyers are unlikely to downsize. But Libby expects the Europeans to have at least a $10,000 price premium over cars such as the Chevrolet Cruze and Ford Fiesta: "I do not think Mercedes-Benz and BMW will want to go into the market with a car that is $19,000. They will start at the upper end."